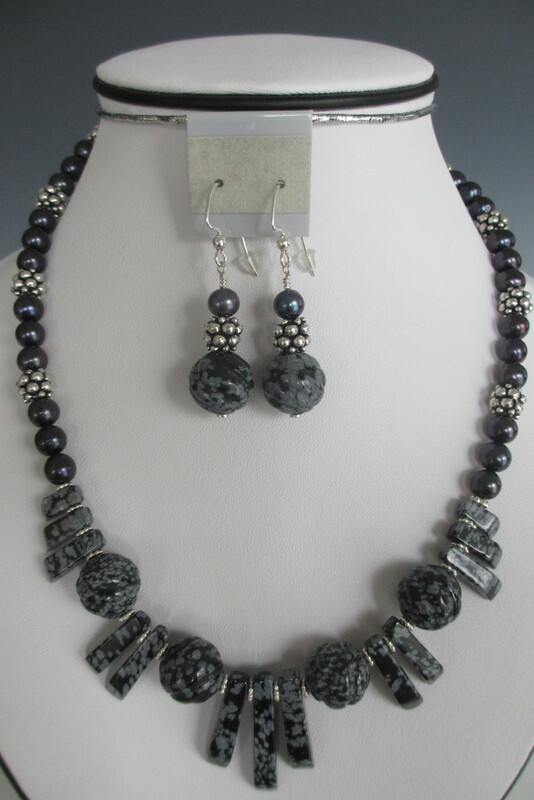 21" Necklace and earring set includes: Necklace with black and white banded agate stones, white freshwater pearls, onyx beads and sterling silver findings and clasp. Earrings (not shown) feature a single round white freshwater pearl and an onyx bead suspended in a sterling silver loop. spacers and pewter rounds with a pewter clasp. ​ crystals and silver findings and clasp. this product so we may verify inventory. We'll respond quickly with instructions. 19-1/2" Necklace and earring set: Onyx facetted beads and white freshwater pearls with sterling silver tubes and spacers closed by a toggle and loop clasp. 33" Necklace and earring set: Onyx facetted beads and white freshwater pearls with sterling silver findings and closed by a sterling silver clasp. Earrings (not shown) have a matching pearl and facetted onyx ball. 18" Necklace and earring set: Onyx polished facetted and button beads, twisted tubes, balls and large 20 mm facetted ball, star-shaped and round white freshwater pearls, crystal spacers, sterling silver filigree ovals closed by a sterling silver toggle and loop clasp. Earrings are approximately 1.75" and have a facetted onyx square hanging from silver plated hooks. 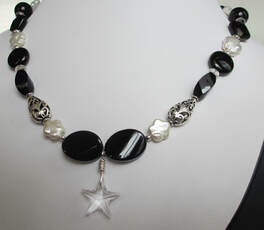 18" Necklace and earring set: Onyx polished facetted and button beads and balls, white star-shaped freshwater pearls crystal spacers and a star-shaped crystal pendant closed by a distinctive silver plated clasp. Earrings (not shown) are approximately 3" and have onyx balls and an identical star-shaped crystal hanging from silver plated hooks. 27" Necklace and earring set: An asymmetric design featuring a striking black and pink quartz bead complimenting variously shaped onyx facetted beads and oval white freshwater pearls with sterling silver spacers and jet crystals closed by a toggle and loop clasp.